Nicolai, Philipp, D.D., son of Dieterich Nicolai, sometime Lutheran pastor at Herdecke, in Westphalia, and after 1552, at Mengeringhausen in Waldeck, was born at Mengeringhausen, August 10, 1556. (The father was son of Nicolaus Rafflenbol, of Rafflenbol, near Hagen, in Westphalia, and in later life had adopted the Latinised form Nicolai of his father's Christian name as his own surname.) In 1575 Nicolai entered the University of Erfurt, and in 1576 he went to Wittenberg. After completing his University course in 1579 (D.D. at Wittenberg July 4, 1594), he lived for some time at Volkliardinghausen, near Mengeringhausen, and frequently preached for his father. In August, 1583, he was appointed Lutheran preacher at Herdecke, but found many difficulties there, the members of the Town Council being Roman Catholics. After the invasion by the Spanish troops in April, 1586, his colleague re-introduced the Mass, and Nicolai resigned his post. In the end of 15S6 he was appointed diaconus at Niederwildungen, near Waldeck, and in 1587 he became pastor there. He then became, in Nov. 1588, chief pastor at Altwildungen, and also court preacher to the widowed Countess Margafetha of Waldeck, and tutor to her son, Count Wilhelm Ernst. Here he took an active part on the Lutheran side in the Sacramentarian controversy, and was, in Sept. 1592, inhibited from preaching by Count Franz of Waldeck, but the prohibition was soon removed, and in the Synod of 1593 held at Mengeringhausen, he found all the clergy of the principality of Waldeck willing to agree to the Formula of Concord. In October, 1596, he became pastor at Unna, in Westphalia, where he again became engaged in heated controversy with the Calvinists; passed through a frightful pestilence (see below); and then on Dec. 27, 1598, had to flee before the invasion of the Spaniards, and did not return till the end of April, 1599. Finally, in April 1601, he was elected chief pastor of St. Katherine's Church, at Hamburg, where he entered on his duties Aug. 6, 1601. On Oct. 22, 1608, he took part in the ordination of a colleague in the St. Katherine's Church, the diaconus Penshora, and returned home feeling unwell. A violent fever developed itself, under which he sank, and died Oct. 26, 1608 (D. Philipp Nicolai’s Leben und Lieder, by L. Curtze, 1859; Koch, ii. 324; Allgemeine Deutsche Biographie xxiii. 607, &c). In Hamburg Nicolai was universally esteemed, was a most popular and influential preacher, and was regarded as a "pillar" of the Lutheran church. In his private life he seems to have been most lovable and estimable. Besides his fame as a preacher, his reputation rests mainly on his hymns. His printed works are mostly polemical, often very violent and acrid in tone, and such as the undoubted sincerity of his zeal to preserve pure and unadulterated Lutheranism may explain, but cannot be said to justify. Of his hymns only four seem to have been printed. 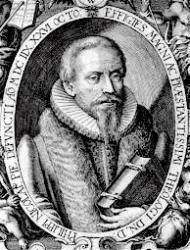 Three of Nicolai's hymns were first published in his devotional work entitled Frewden-Spiegel dess ewigen Lebens, published at Frankfurt-am-Main, 1599 (see further below). The two noted here ("Wachet auf” and “Wie schon") rank as classical and epoch-making. The former is the last of the long series of Watchmen's Songs. The latter marks the transition from the objective churchly period to the more subjective and experimental period of German hymn writing; and begins the long series of Hymns of Love to Christ as the Bridegroom of the Soul, to which Franck and Scheffler contributed such beautiful examples. Both are also worthy of note for their unusual and perfect rhythms, and for their splendid melodies. i. Wachet auf, ruft uns die Stimme. Eternal Life. This beautiful hymn, one of the first rank, is founded on St. Matt. xxv. 1-13; Rev. xix. 6-9, and xxi. 21; 1 Cor. ii. 9; Ezek. iii. 17; and Is. lii. 8. It first appeared in the Appendix to his Frewden-Spiegel, 1599, in 3 st. of 10 1., entitled "Of the Voice at Midnight, and the Wise Virgins who meet their Heavenly Bridegroom. Matt. 25." Thence in Wackernagel v. p. 259, the Unverfälschter Liedersegen, 1851, No. 690, and most German collections. It is a reversed acrostic, W. Z. G. for the Graf zu Waldeck, viz. his former pupil Count Wilhelm Ernst, who died at Tübingen Sept. 16, 1598, in his fifteenth year. It seems to have been written in 1597 at Unna, in Wesphalia, where Nicolai was then pastor; and during the terrible pestilence which raged there from July, 1597, to January, 1598, to which in July 300, in one week in August 170, and in all over 1300 fell victims. Nicolai's parsonage overlooked the churchyard, and there daily interments took place, often to the number of thirty. In these days of distress, when every household was in mourning, Nicolai's thoughts turned to Death, and thence to God in Heaven, and to the Eternal Fatherland. Jn the preface (dated Aug. 10, 1598) to his Frewden-Spiegel he says: "There seemed to me nothing more sweet, delightful and agreeable, than the contemplation of the noble, sublime doctrine of Eternal Life obtained through the Blood of Christ. This I allowed to dwell in my heart day and night, and searched the Scriptures as to what they revealed on this matter, read also the sweet treatise of the ancient doctor Saint Augustine [De Civitate Dei]. ..... Then day by day I wrote out my meditations, found myself, thank God! wonderfully well, comforted in heart, joyful in spirit, and truly content; gave to my manuscript the name and title of a Mirror of Joy, and took this so composed Frewden-Spiegel to leave behind me (if God should call me from this world) as the token of my peaceful, joyful, Christian departure, or (if God should spare me in health) to comfort other sufferers whom He should also visit with the pestilence .... Now has the gracious, holy God most mercifully preserved me amid the dying from the dreadful pestilence, and wonderfully spared me beyond all my thoughts and hopes, so that with the Prophet David I can say to Him "0 how great is Thy goodness, which Thou hast laid up for them that fear Thee," &c.
"Wachet auf! ruft uns die Stimme Der Wachter sehr hoch auf der Zinne"
are borrowed from one of the Wächter-Lieder, a form of lyric popular in the Middle Ages, introduced by Wolfram von Eschenbach. (See K. Goedeke's Deutsche Dichtung im Mittelalter, 1871, p. 918.) But while in the Songs the voice of the Watchman from his turret summons the workers of darkness to flee from discovery, with "Nicolai it is a summons to the children of light to awaken to their promised reward and full felicity. The melody appeared first along with the hymn, and is also apparently by Nicolai, though portions of it (e.g. 1. 1 by the Gregorian Fifth Tone) may have been suggested by earlier tunes. It has been called the King of Chorales, and by its majestic simplicity and dignity it well deserves the title. Since its use by Mendelssohn in his St. Paul it has become well known in England, and, in its original form, is given in Miss Winkworth's Chorale Book for England, 1863 (see below). 1. Sleepers wake, a voice is calling. This is an unrhymed translation of st. i. by W. Ball in his book of words to Mendelssohn's oratorio of St. Paul, 1836. This form is in Horder's Congregational Hymns, 1884, and others. In the South Place [London] Collection, 1873, it is a recast by A. J. Ellis, but opens with the same first line. In the Parish Hymn Book, 1875, a translation of st. ii., also unrhymed, is added. 2. "Wake ye holy maidens, wake ye. A good translation contributed by Philip Pusey to A. R. Reinagle's Collection of Psalm and Hymn Tunes, Oxford, 1840, p. 134. It was considerably altered, beginning "Wake, ye holy maidens, fearing" in the Salisbury Hymn Book, 1857, and this is repeated, with further alterations, in Kennedy, 1863, and the Sarum Hymnal, 1868. 3. Wake, arise! the call obeying. A good translation by A. T. Russell, as No. 110 in the Dalston Hospital Hymn Book 1848. 4. Wake, oh wake; around are flying. This is a recast, by A. T. Russell, not for the better, from his 1848 translation, as No. 268 in his Psalms & Hymns. 1851, st. iii. being omitted. Thence, unaltered, in the New Zealand Hymnal, 1872. 5. Wake, awake, for night is flying. A very good translation by Miss Winkworth, in her Lyra Germanica, 2nd Ser., 1858, p. 225, repeated in her Chorale Book for England, 1863, No. 200, with st. ii., 11. 7, 8, rewritten. Included in the English Presbyterian Psalms & Hymns, 1867; Scottish Presbyterian Hymnal, 1876, &c.; and in America, in Laudes Domini, 1884, and others. In the Cantate Domino, Boston, U. S., 1859, it begins "Awake, awake, for night is flying." 6. Wake! the startling watch-cry pealeth. By Miss Cox, in Lyra Messianica, 1864, p. 4, and her Hymns from the German, 1864, p. 27; repeated in W. F. Stevenson's Hymns for Church and Home, 1873. The version in J. L. Porter's Collection, 1876, takes st. i., 11. 1-4 from Miss Cox. The rest is mainly from R. C. Singleton's translation in the Anglican Hymn Book, but borrows lines also from Miss Winkworth, and from the Hymnary text. 7. Wake! the watchman's voice is sounding. By R. C.Singleton. This is No. 259 in the Anglican Hymn Book, 1868, where it is marked as a "versification by R. C. Singleton, 1867." 8. Wake, awake, for night is flying. This is by Canon W. Cooke, in the Hymnary, 1871, and signed A. C. C. In the edition of 1872, 11. 7, 8 of st. ii. are recast, and the whole is marked as " based on E. A. Dayman." It is really a cento, four lines of the 1872 text (i., 1. 5; ii., 11. 7, 8; iii., 1. 9) being by Canon Cooke; and the rest being adapted from the versions of P. Pusey as altered in the Sarum Hymnal, of Miss Winkworth, of Miss Cox, and of R. C. Singleton. It may be regarded as a success, and as passed into the Society for Promoting Christian Knowledge Church Hymns, 1871; the 1874 Appendix to the New Congregational Hymn Book; Horder's Congregational Hymns, 1884, and others. 9. Wake, arise! the voice is calling. This is an anonymous translation in the Ohio Lutheran Hymnal, 1880. 10. Slumberers, wake, the Bridegroom cometh. A spirited version, based on Miss Winkworth (and with an original st. as iv. ), by J. H. Hopkins in his Carols, Hymns & Songs, 3rd ed., 1882. p. 88, and dated 1866. Repeated in the Hymnal Companion (Reformed Episcopal) Philadelphia, U.S., 1885. (1) “Awake, the voice is crying." In Lyra Davidica, 1108, p. 73. (2) "Awake! awake! the watchman calls." By Miss Fry, 1845, p. 33. (3) "Hark! the trump of God is sounding." By Dr. H. Mills, 1845 (1856, p. 269. This is from the altered form by F. G. Klopstock, in his Geistliche Lieder, 1758, p. 246, as further altered in Zollikofer's Gesang-Buch, 1766, No. 303, where it begins "Wachet auf! so ruft." (4) "Awake, arise, the voice gives warning." In the United Presbyterian Juvenile Missionary Magazine, 1857, p. 193; repeated in 1859, p. 171, beginning, “Awake, arise, it is the warning." (5) “Waken! From the tower it soundeth." By Mrs. Bevan, 1858, p. 1. (6) Up! awake! his summons hurried." By J. D.Burns, in the Family Treasury, 1860, p. 84, and his Memoir & Remains, 1869, p. 234. "One morning in great distress and tribulation in his quiet study. He rose in spirit from the distress and death which surrounded him to his Redeemer and Saviour, and while he clasped Him in ardent love there welled forth from the inmost depths of his heart this precious hymn of the Saviour's love and of the joys of Heaven. He was so entirely absorbed in this holy exaltation that he forgot all around him, even his midday meal, and allowed nothing to disturb him in his poetical labours till the hymn was completed "—-three hours after midday. As Nicolai was closely connected with Waldeck he formed with the initial letters of his stanzas the acrostic W. E. G. U. H. Z. W., viz. Wilhelm Ernst Graf Und Herr Zn Waldeck— his former pupil. The hymn has reminiscences of Eph. v., of Canticles, and of the Mediaeval Hymns to the Blessed Virgin Mary. It became at once a favourite in Germany, was reckoned indispensable at weddings, was often sung around death beds, &c. The original form is in Wackernagel v. p. 258, and the Unverfälschter Liedersegen, 1851, No. 437; but this (as will be seen by comparing Miss Winkworth's version of 1869) is hardly suited for present day congregational use. In Bunsen's Versuch, 1833, No. 554, it is slightly altered. The form in Knapp's Evangelischer Lieder-Schatz, 1837, No. 2074 (1865, No. 1810) is a recast by Knapp made on Jan. 14, 1832, and published in his Christoterpe, 1833, p. 285, preceded by a recast of "Wachet auf! "; both being marked as “rewritten according to the requirements of our times." The popularity of the hymn was greatly aided by its beautiful chorale (named by Mr. Mercer, Frankfort), which has been called "The Queen of Chorales," and to which many city chimes in Germany were soon set. It was published with the hymn, and is probably an original tune by Nicolai, though portions may have been suggested by earlier melodies, especially by the "Resonet in laudibus," which is probably of the 14th cent. (Bäumker i., No. 48, cites it from the Obsequiale, Ingolstadt, 1570. In Alton's Congregational Psalmist named Arimathea). 1. How bright appears the Morning Star! This is a full and fairly close version by J. C. Jacobi, in his Psalter Germanica, 1722, p. 90 (1732, p. 162); repeated, with alterations, in the Moravian Hymn Book, 1754, pt. i., No. 317 (1886, No. 360). The versions of st. v., vii. beginning, "The Father from eternity," are included in Aids to the Service of Song, Edinburgh N.D., but since 1860. In 1855 Mercer gave in his The Church Psalter & Hymn Book., as No. 15, a hymn in 4 stanzas of 10 lines, of which five lines are exactly from Jacobi. St. i., l1. 1-3; ii., .11. 8, 9 ; iii., 11. 2, 3, 6 ; iv., 1. 10, are exactly; and i., 1. 9; ii., 11. 2, 3, 6, 10; iii., II. 1, 4, 5; iv., 11. 7, 9 are nearly from the Moravian Hymn Book, 1801. The interjected lines are by Mercer, but bear very slight resemblance either to Nicolai's original text, or to any version of the German that we have seen. In his 1859 edition he further recast it, leaving only the first line unaltered from Jacobi; and this form is in his Oxford edition, 1864, No. 121, in the Irish Church Hymnal, 1869 and 1873, and in the Hymnal Companion 1870 and 1876. In Kennedy, 1863, the text of 1859 is given with alterations, and begins "How brightly dawns the Morning Star;" and this form is in the People's Hymnal, 1867; Dale's English Hymn Book 1874, &c.
2. How graciously doth shine afar. By A. T. Russell, as No. 8 in the Dalston Hospital Hymn Book, 1848, and repeated in the Cheltenham College Hymn Book, No. 37. It is a free translation of st. i., vi., v.
3. How lovely shines the Morning Star! A good and full translation by Dr. H. Harbaugh (from the text in Dr. Schaff’s Deutsches Gesang-Buch, 1860), in the German Reformed Guardian, May, 1860, p. 157. Repeated in full in Schaff's Christ in Song, 1869, and abridged in Adams's Church Pastorals, Boston, U.S.A., 1864. 4. 0 Morning Star! how fair and bright. A somewhat free translation of st. i., iii., iv., vii., by Miss Winkworth, as No.149 in her Chorale Book for England, 1863. Repeated in the Pennsylvania Lutheran Church Book, 1868; Ohio Lutheran Hymnal,1880, &c.
6. How brightly glows the Morning Star. In full, from Knapp's German recast, by M. W. Stryker, in his Hymns & Verses, 1883, p. 52; repeated, omitting st. ii., iv., in his Christian Chorals, 1885, No. 145. (1) "How fairly shines the Morning Star." In Lyra Davidica, 1708, p. 40. (2) "As bright the star of morning gleams" (st. i.) By W. Bartholomew, in his book of words to Mendelssohn's oratorio of Christus, 1852, p. 11. (3) "How lovely now the Morning Star." By Miss Cox, 1864, p. 229. (4) "How beauteous shines the Morning Star." By Miss Burlingham, in the British Herald, Oct. 1865, p. 152, and Reid's Praise Book, 1872. (5) "0 Morning Star, how fair and bright." By MissWinkworth, 1869, p. 160. (6) "How bright appears our Morning Star." By J. H. Hopkins, in his Carols, Hymns and Songs, 3rd ed., 1882, p. 168, and dated 1866.